Intel took the wraps off its most powerful consumer CPU at the PAX video-game conference in Seattle, WA, today. 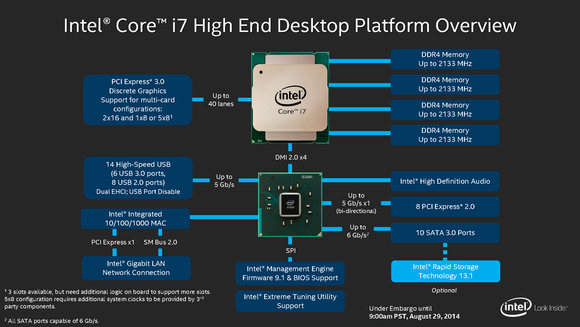 Intel’s Core i7 High-end Desktop Processor Family, code-named Haswell-E, consists of three unlocked processors that support hyperthreading, DDR4 memory, and Intel’s all-new X99 chipset. 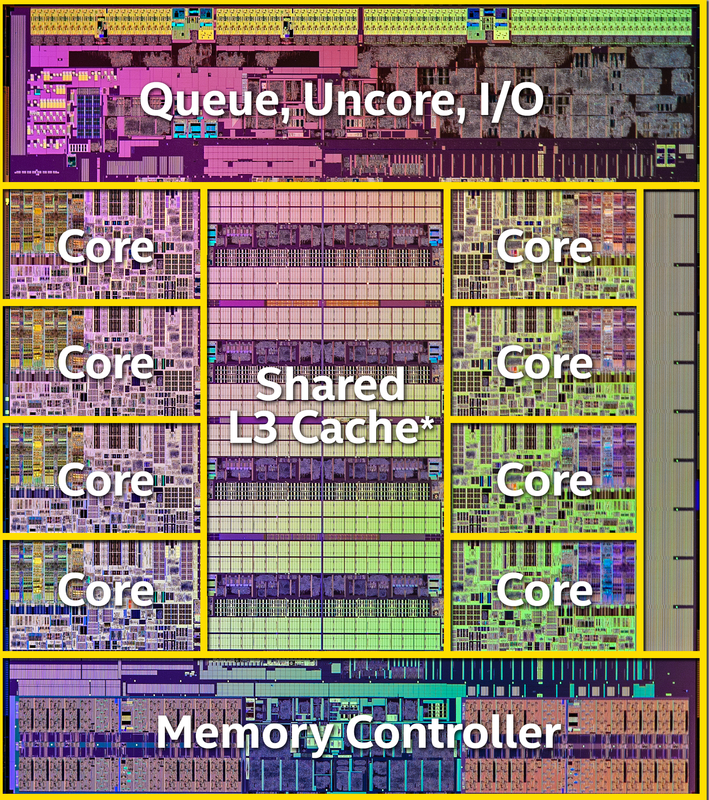 The top-of-the-line Core i7-5960X boasts eight cores (16 processor threads), 20MB of cache, and 40 PCIe 3.0 lanes. This $999 processor runs at a base clock frequency of 3.0GHz and torques up to 3.5GHz in turbo mode. Intel manufactures server chips with almost twice as many cores as this, but the company won't bring that technology to its consumer business any time soon. It doesn't need to—it's already competing with itself on that front. The Core i7-5930K provides six physical cores (12 processor threads), 15MB of cache, and 40 PCIe 3.0 lanes. Its base clock frequency is 3.5GHz (up to 3.7GHz in turbo mode) and costs $583. The Core i7-5820K is also a six-core (12 processor threads) CPU with 15MB of cache, but it supports only 28 PCIe 3.0 lanes. It runs at a base clock of 3.3GHz and a turbo frequency of 3.6GHz. 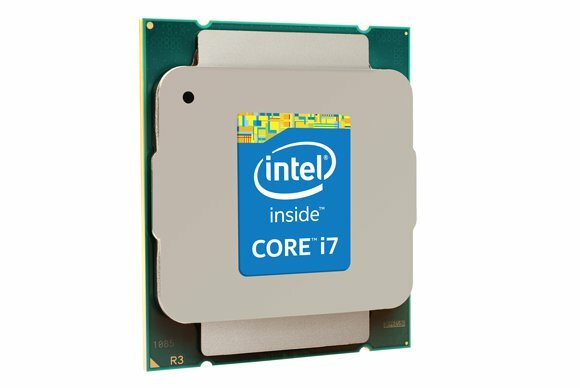 Intel is pricing this chip at $389. Since all three processors are unlocked, system builders and end users can tweak the PC's BIOS to run the CPUs at even higher clock speeds. Intel is shipping three Haswell-E processors. This chart compares them to each other and to Intel's existing unlocked Haswell parts. When Intel launched the original Haswell family of processors in June 2013, its messaging was all about power consumption, integrated graphics, and cooling. In other words, Intel was most interested in pursuing the laptop, hybrid, and tablet markets. Sure, the fourth-generation mobile and desktop Core processors were somewhat faster than the third-generation Core processors that preceded them (with a notable exception that I’ll explain in a moment), but that chip family’s biggest improvements were reduced power consumption (to extend battery life), better graphics (to reduce the need for outboard GPUs and to extend battery life), and lower thermal design power or TDP (to reduce cooling requirements and extend battery life). TDP specifies how much electrical power a computer must be able to dissipate in a worst-case scenario: while the CPU is operating at its maximum speed for a sustained period. Did I mention Intel’s focus on battery life? Power users had to wait (and wait) for Ivy Bridge-E parts to get their next fix. 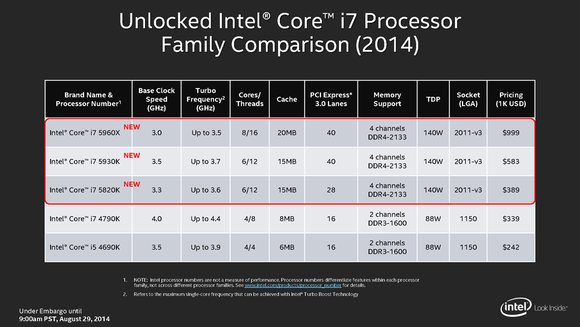 Those unlocked processors, based on Intel’s third-generation Core architecture, hit the market in September 2013. The best of that family of three maxed out at six cores (with hyperthreading to support 12 processor threads). Like Ivy Bridge-E, Haswell-E CPUs don’t waste any die space on integrated graphics. Anyone who buys one of these parts, or a complete desktop PC built around one, will rely on one or more discrete video cards for graphics. Haswell-E processors are the first consumer desktop CPUs to support quad-channel DDR4/2133 memory. And that’s where Haswell-E’s support for up to 40 PCIe 3.0 lanes comes into play: It enables a motherboard to support up to four discrete video cards (Ivy Bridge-E boasted the same feature). As you’ve probably guessed, anyone looking to upgrade from Ivy Bridge-E to Haswell-E will also need to buy a new motherboard and memory. Intel's Haswell-class Extreme Edition parts must be installed in a motherboard with an LGA 2011-v3 socket and an Intel X99 chipset. The cores on Haswell-E processors share up to 20MB of L3 cache and are the first consumer desktop CPUs to support DDR4/2133 memory, providing four memory channels where Intel’s most recent CPUs support only two channels to DDR3 memory (at speeds up to 1866MHz). While some boutique PC builders are touting the benefits of this increase in bandwidth, an Intel spokesperson told me in a briefing earlier this week that in these early days, DDR4’s primary benefit will be reduced power draw. 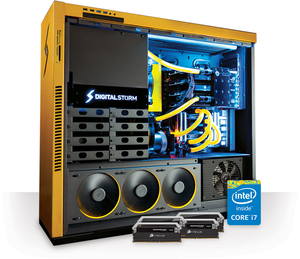 Digital Storm and other boutique PC builders will be among the first to jump on the Haswell-E bandwagon. That gave me a chuckle, because Intel otherwise threw caution to the wind in terms of thermal design power; after all, you’ll never see one of these chips in a notebook. Each of the three new Extreme Edition processors has a TDP of 140 watts. That’s 10 watts higher than its Ivy Bridge-E parts, and it’s considerably higher than Intel’s other unlocked Haswell processors—the Core i7-4790K (code-named Devil’s Canyon) and the Core i5-4690K—which have TDPs of just 88 watts. Intel’s mainstream Core i7 desktop processors, meanwhile, have TDPs as low as 35 watts. In addition to its DDR4 support, Intel’s X99 chipset provides up to six USB 3.0 ports, eight USB 2.0 ports, eight PCIe 3.0 lanes, and 10 SATA 6Gbps ports (Intel’s X79 chipset supports six SATA ports, but only two are the faster 6Gbps variety). Support for Intel’s Rapid Storage Technology 13.1 is optional. Intel describes the X99 chipset as “Thunderbolt Capable,” but X99 motherboards must be “Thunderbolt Ready,” meaning they have a connector for a Thunderbolt 2 add-in card. Thunderbolt 2 offers twice the bidirectional throughput of the original Thunderbolt spec—20Gbps—and supports daisy-chaining up to six devices on a single port. Who needs that much throughput? Content creators editing 4K video, rendering 3D images, or developing games. Thunderbolt 2 is overkill for most consumers; but since it comes in the form of an add-in card, you won’t pay for it unless you need it. As I said at the beginning, Haswell-E is aimed at gamers, content creators, and unabashed PC enthusiasts. 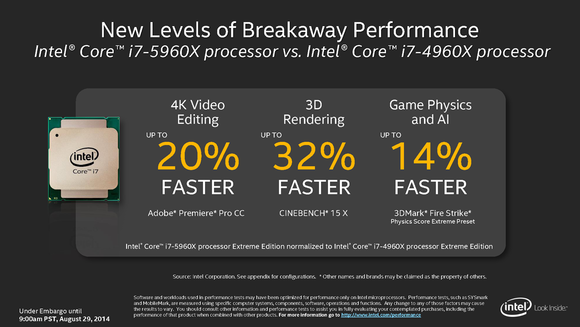 Intel claims the Core i7-5960X is up to 20-percent faster at editing 4K video, 32-percent faster rendering 3D graphics, and 14-percent faster processing game physics and AI. 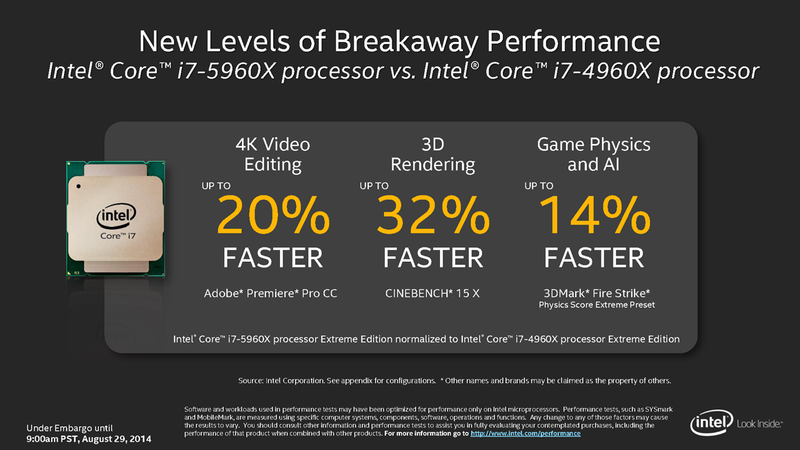 Intel also claims that Haswell-E’s increased core and thread counts enable its best processor to convert 4K video to 1080p (using Handbrake), 34-percent faster than its six-core Core i7-4960X (Ivy Bridge-E), and 69-percent faster than its quad-core Core i7-4790K (Haswell). Content creators and gamers will benefit most from the power of Intel's Haswell-E processor. Most popular content-creation programs—including Adobe Photoshop and Premiere Pro, Sony Vegas Pro, and Cakewalk Sonar—are multi-threaded and can take full advantage of the multiple cores and processor threads Intel’s Extreme-series processors deliver. Games will benefit somewhat less, and this class of CPU is complete overkill for productivity apps and media playback. But speed junkies are sure to be pleased. Intel provided us with a Core i7-5960X so we could vet these claims; unfortunately, we didn’t get a compatible motherboard in time to publish benchmarks. I’ll update this story with that information soon.